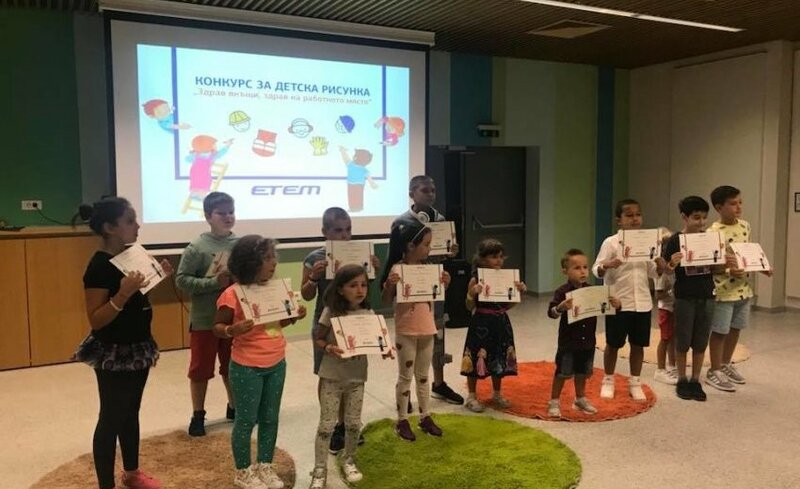 The competition is part of the socially responsible campaign "Healthy at Home, Healthy at Work"
24 children of ETEM employees took part in the children's drawing contest, organised by the company, which is part of ETEM's initiative "Healthy at Home, Healthy at Work". The children were challenged to make a picture of how they imagine "Mom and Dad's workplace". In the art competition attended by kids of different ages 4 to 14 years. At a special event at "Museum", all participants were encouraged with a prize, and the best drawings were awarded accordingly. The aim of the initiative is to focus the employees' attention on safety at work and to show in an informal way the company's serious attitude to their health and safety. "By the children's drawing contest, we wanted to include the families of our employees in the workplace safety discussion.At the same time, we believe that it is useful and educational for children to know what their parents' workplace is and what rules should be followed to avoid to be hurt”, said Thomas Purnell, Human ResourcesDirector of ЕТЕМ.